Meet the Only Indian Woman to Participate in ‘The Most Dangerous Race in the World…..
Who wants to ride through 17 cities, over 3000 kms, in 2 weeks over bumpy roads in a flimsy vehicle? Only crazy extreme-adventure-sport-loving foreigners, right? Wrong! There’s one daring 29-year-old from Mumbai who also decided to take on the challenge. Meet Rutavi Mehta, just back from her maiden auto rickshaw race, which she finished in only 12 days. In April, 2015, about 250 people from over 50 countries came down to India to be part of a very unique adventure sport – an auto rickshaw run. The challenge was to drive an auto rickshaw for about 3,000 kms, from Jaisalmer in Rajasthan to Shillong in Meghalaya, covering the breadth of the country in just two weeks — that’s six states and 17 cities. This feat, considered one of the most dangerous adventure sports in the world, had to be accomplished without any backup teams of mechanics, no guidance in terms of directions or any other help, in barely roadworthy vehicles that are certainly not meant to be driven long distance. Among these 250 people, there was just one Indian participant – Rutavi Mehta. At that time though, she hadn’t even dreamt that she would herself participate in the run one day. Rutavi is from the hospitality industry and has backpacked through Europe in the past. As a travel consultant today, she runs her own company called Photokatha – a place where various travelers from across the country share their travel experiences. She also runs various campaigns with tourism boards of different states as a consultant. Recently, she got a chance to design and head a Kerala Blog Express campaign where 27 international bloggers traveled in different parts of Kerala to experience the culture of the state. The Rickshaw Run is organized by a UK-based group known as ‘The Adventurists.’ The first run took place in 2006, when the contestants covered the route from Kochi in Kerala to Darjeeling in West Bengal. Since then, the sport is organized with a different route in India every six months, and there has never been a single run in which all the participants have reached the finish line. The only necessary requirement for competing is that every team (usually 3 people) should raise a minimum amount of £1000 (USD 1550) for organizations that are working towards the protection of the environment. The two organizations they donated to were Cool Earth and Planeterra. Cool Earth is an environmental charity group working for the protection of rainforests and the local communities living in those areas. Planeterra is also a non-profit organization that helps empower local people to develop their communities and conserve their environment. Rutavi was very unsure about participating in the race at first. “A couple of my friends from the travel blogger industry were coming to India and they wanted to be a part of the run. They had already registered for it, but I was not sure,” she remembers. 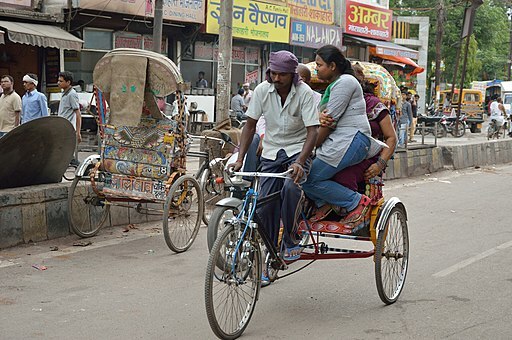 “In a rickshaw, 300 km is like 600 km by car, since the maximum speed is only 55 km/hr, and you don’t have any cushions to support you during the bumpy ride,” says Rutavi. The race is an expensive one, says Rutavi. The registration fee itself is £2500, a part of which goes directly for charity. In return for the registration amount, they only get the rickshaw. Her team decided to crowd fund this fee, and with the help of friends, family, some corporate organizations and the travelling network created by all three of them, they raised enough for registration as well as for the cause even before the race had started. As for their accommodation, they partnered with different organizations and individuals. “Since we are travel bloggers, many companies supported us. Zostel (a chain of backpackers’ hostels) came on board as the hospitality partner. In most of the cities we stayed in Zostel and we partnered with similar organizations for our stay and food in other parts,” says Rutavi. Mountainous terrain, broken roads, unknown paths, and rivers to cross – Rutavi saw it all during the journey. “I met people from so many countries and got a chance to learn about their cultures. People from Norway, Canada, some countries that I had never even heard about – I learnt how they live, about their culture, food, music, and so much more. There was also a lot of creativity going on around us. Rickshaws were decorated in many unique and brilliant ways,” she says. But there were some very difficult spots as well. 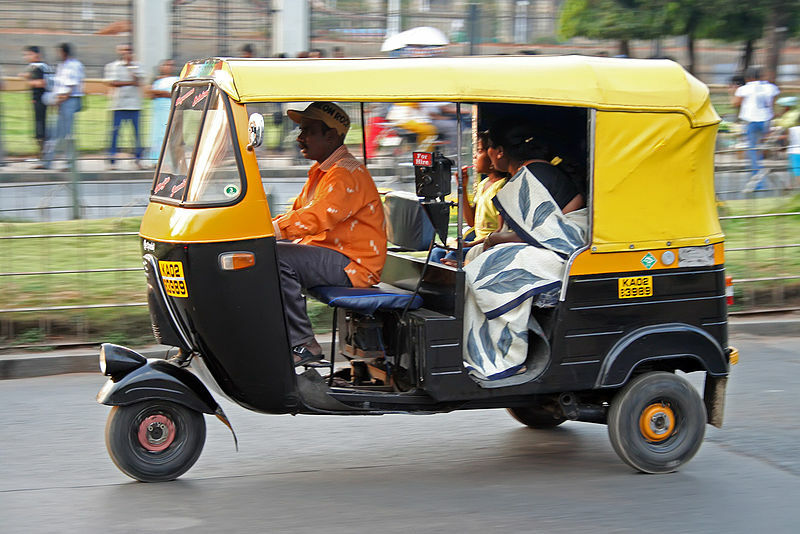 The rickshaw run is considered to be one of the most dangerous adventurous sports by many. Watch this video clip …. This is because the difficult roads have to be covered on a three wheeler seven horsepower rickshaw, without any support or knowledge about the way, without any back-up or a set route. Rutavi’s team survived two accidents also. One was in Allahabad and the other one in Guwahati, just 150 km before the final destination. But she did not give up and made it to the finish line in spite of some bad injuries. The one thing that she realised with this journey is that no matter which part of India you are in, people are very helpful. She was amazed to see how the local people turned up to help every time they needed something. If the rickshaw broke down, mechanics would help them without taking any money in return, and people would also offer food at many places. All because they were happy to see a very simple vehicle being used for a charitable cause! Rutavi says she has travelled to 1500 destinations around the world so far. This enthusiastic wayfarer has spent months exploring Lakshadweep all on her own. She also goes to Ladakh for two months every year where she teaches kids. “To empower Indian women with a ‘women can do, and will do’ attitude. People keep saying India is not safe. The aim was to show that women can travel fearlessly in India. It all starts with the realization that they can overcome any fear,” she says. “My attitude towards rickshaw rides has also changed. Whenever I travel by rickshaws now, I talk to the drivers and tell them about my experience. Many of them can’t believe that I rode a rickshaw for such a long time,” she concludes laughing.